We’d love your help. Let us know what’s wrong with this preview of A Time Of Dread by John Gwynne. Now much of the Banished Lands is ruled b The Ben-Elim, a fierce race of warrior-angels, burst into the Banished Lands over a hundred and thirty years ago. They were in pursuit of their eternal enemy, the Kadoshim demon-horde. On that day a great battle was fought, the Ben-Elim and Kadoshim joined by allies from the races of both men and giants, and a great victory was won. To ask other readers questions about A Time Of Dread, please sign up. is this a sequel to the Faithful and the Fallen series?! It's not a sequel in the true sense of the word, though it is related to the first series. A TIME OF DREAD is set in the Banished Lands, 130 years after the events that take place in WRATH, so all that happened in the Faithful and the Fallen is now the history of this new series. But I have written Of Blood and Bone as an entirely new series, with new characters and plot. There are references to the Faithful and the Fallen, but you do not need to have read it to understand or enjoy this new series. The Banished Lands are my version of an alternative, mythological Europe. If The Faithful and the Fallen was inspired by the rise of Julius Caesar and his Gallic Wars, as well as Milton's Paradise Lost, this new series is inspired by Attila the Hun, the Fall of the Roman Empire, the Volsung Saga and the Book of Enoch. So, just as if you were reading a history book, you could read about the Fall of the Roman Empire without knowing all about Julius Caesar, but if you did, it would make the reading experience a little richer and deeper. Who would you say is the main character in this one? It seems like it's Drem, but I'm not quite sure. Great to hear from you, and a great question. I haven't approached this series with a main character in mind. There are four Points-Of-View in A Time of Dread. Drem, Riv, Bleda and Sig. I saw all of them as equal-ish, although I think Drem had more chapters than the others. Riv wasn't too far behind him. I suppose you could say that Drem and Riv have the edge on page time, though the gap isn't huge. Simply amazing and almost impossible to put down, A Time of Dread is truly a masterful start to a trilogy which I envision will be crowned as one of the best series I’ve ever read by its end. John Gwynne has proven himself once again to be the constant harbinger of superlative epic fantasy that only the greatest of authors can achieve. Let it be known that Gwy ARC provided by the publisher—Pan Macmillan—in exchange for an honest review. Let it be known that Gwynne is in fact the only author on my list to earn the perfect streak of top quality achievements from me. A Time of Dread marked the fifth time his work has been included in my ‘favorites of all time’ shelves; together with his previous quartet, that’s five out of five books. To do a bit of comparison, neither of my two other favorite authors—Brandon Sanderson and Joe Abercrombie—earned this perfect streak. I can be quite petty with ratings; I don’t give a lot of full five out of five stars ratings. Gwynne, however, never ceased to impress me with his pure and unadulterated talent, and is one of the few authors who always did everything right for my epic fantasy craving. The Faithful and the Fallen is one of the series that I recommend the most often to every fantasy readers I know, whether it’s on Bookstagram, Booktube, Goodreads, or real life; I’m going to keep on doing that, except that starting from now, Of Blood and Bone will be included. The first book in the Of Blood and Bone trilogy is a stunning and darker return to the world of the Banished Lands, the same world as his previous series. Creating a new series with a different cast in the same world is risky. The author has to do a lot of things right such as making sure the story will feel different and at the same time, retaining the elements that made his previous work magnificent in the first place; there’s nothing to worry about here because Gwynne achieved all that. Just from looking at the cover, it’s quite obvious there is a huge contrast between Gwynne’s debut, Malice, and A Time of Dread. Where Malice used a white background, A Time of Dread used black; this captured the tone of the book perfectly. Unlike his previous series, the line between good and evil is more blurry here. The plot is also highly addictive to read. By building the tension with each page turned, the last 20% of the book became one damn fine breathtaking and compelling book to read. Also, for those of you who had trouble with the myriad amount of characters in TFatF, A Time of Dread casts are smaller in quantity, with only four main POV to follow throughout the entire book; Drem, Riv, Bleda, and one side character from the previous series. Speaking of characters: for me, the driving force of a compelling book depends hugely on its characters. If I have to choose, I prioritize marvelous characterization over anything else. Great plot, thrilling actions, and good prose are all almost pointless if I can’t bring myself to care about the fate of the characters in the book. Luckily, one of Gwynne’s greatest qualities as a writer is his stupendous achievement with characterizations. This book strengthens the notion that he’s one of the greatest SFF authors out there when it comes down to writing lovable protagonists and despicable villains. It’s excellent how he always managed to evoke my emotions through the characters' actions and interactions; they felt so real. Do know however that it’s not only the new characters that stole the spotlight in the book; some characters from Gwynne’s previous series do make an appearance here. Whether it’s in the form of their descendants or, in one case, as one of the main POV, I found all the protagonists endearing and the villains despicable. Hundreds of years have passed, so most of our beloved characters have become legendary figures and their names and deeds are mentioned a lot here. If you’re a fan of TFatF, all the homage paid to those characters is guaranteed to spark a lot of nostalgia. I’ve read a lot of epic fantasy books and I’m confident enough to say without hesitation that Gwynne is one of—if not the—best when it comes to writing grippingly realistic battle scenes. The nock of arrows, the clashing of steel, the explosion of blood, the formation of shield walls; his action scenes have always been very cinematic, intricate, immersive and dynamic, and this book is no exception. In fact, in terms of action, this book and its climax sequences make a lot of other series final book action scenes pale in comparison; Gwynne is miles above the majority of fantasy authors when it comes to close-quarter combat. It’s safe to say that my experience reading this book was enhanced immensely because of my knowledge on the world of the Banished Lands. Realms have come and gone, the state of the world has changed after hundreds of years; there are new factions, new cities, and an altered landscape. However, for longtime fans of Gwynne’s works, familiar names such as Drassil and Starstone Crater are designed to make you feel at home again. Gwynne did a fantastic job improving and reintroducing the established world of the Banished Lands. If you’re like me, not a stranger to this world, it will definitely enrich the already amazing experience of reading this book with the underlying experience we’ve gained. By reading TFatF before reading this, you would have lived through the histories talked about in this book. If you’re new to it, you’ll be just reading through them. In conclusion, the world-building is truly a work of excellence because the lore was actually established in full detail from the previous four books. It’s okay for you to read this book without prior knowledge of the world, but do know that it will spoil you on the events of Gwynne’s previous series. It can’t be helped; it’s this book’s history, after all. My advice? Read TFatF before reading this. You definitely should anyway, because it’s one of the best epic fantasy series out there. One of my favorite things about reading something new from one of my favorite authors is seeing how much he has improved as a writer. Gwynne has come a long way since his debut, Malice. His prose is now even better, extremely well polished and top-notch in quality. I found his writing in this book incredibly engaging, vivid, immersive and bloody addictive to read. It was immensely hard for me to put down the book every time I start reading it; and when I did put it down, I couldn’t help reaching for it like I was having withdrawals. The fact that I finished reading this book in less than a day should say enough about how addictive it was. His prose is the glue that connected all the incredible plot, characterization, action sequences, and world-building to become one of the finest first books in a series I’ve ever read. My time in the Banished Lands will always be one of my most treasured memories and experiences in my fantasy literature adventure, and I was beyond pleased to dive back into this world again. TFatF series has earned its place among my top five favorite series of all time, and Wrath is one of the best books I’ve ever read in my entire life. It’s not an exaggeration to say that it will be extremely hard for Gwynne to create a series that tops my love for his first series. However, I’m anxious to see Gwynne prove me wrong after the amazing things he did with A Time of Dread. Even with my high expectations, A Time of Dread still managed to blow me away; it’s truly a monumental start to a series that’s even better than his debut, Malice, by far. By the end of this book, I was already completely intrigued, hooked, compelled, and eager to read the next book in the trilogy. If you call yourself a fan of heroic or epic fantasy—call it whatever you want—you owe it to yourself to read this book. And IF you’re a fan of Gwynne’s first series, there’s no excuse for you to not read this book. Not only this is one of the greatest start to a series I’ve ever read, Gwynne has truly earned his place among the rank of legendary fantasy authors such as J.R.R. Tolkien, George R.R. Martin, and Brandon Sanderson with what he has achieved with A Time of Dread and his previous series. The waiting game for the next book in the trilogy will be painful, but I know it will be worth the wait. Gwynne hasn’t failed me and I don’t think he ever will at this rate; he’s truly the Bright Star of epic fantasy literature. The official publication date of the book: 11th January 2018 for the UK, and 9th January 2018 for the US. A Time Of Dread brings together all of the promise in John Gwynne's debut, Malice, and delivers a truly excellent read! AToD is in many ways very similar to Malice, it's set in the same world a century later, but with a smaller cast list and greater focus it felt to me like a step up from that successful and highly acclaimed beginning. The previous quartet of books provide a living history to the new series. You absolutely do not have to read those books to enjoy this one though. In the Lord of t A Time Of Dread brings together all of the promise in John Gwynne's debut, Malice, and delivers a truly excellent read! The previous quartet of books provide a living history to the new series. You absolutely do not have to read those books to enjoy this one though. In the Lord of the Rings Tolkien had a huge edifice of history/world-building worked out, and the story on the page was the tip of the metaphorical iceberg. If you start with AToD the previous books are that submerged body of ice. The author that springs to mind most strongly when reading Gwynne is David Gemmell, a favourite of mine. Gwynne's characters are generally strongly heroic, decent, good, brave, and likable while far from perfect. The opposition is demonically evil with almost no hint of ambiguity. These are good things. You wouldn't want every fantasy book to be like that, but they are great stories to have in the mix. And there definitely is nuance, particularly on the "good" side where the issue of how much personal freedom must be ceded in the name of the greater good is put under the microscope. This is a really well put together story. The level of unease (dread) mounts relentlessly, the plot threads come together, and it steadily gets more exciting until you find yourself reading faster and faster and not stopping when you really should be sleeping. Gwynne delivers adrenaline-filled fight scenes with characters you care about, and the outcome never feels certain, that aforementioned dread is convincing, you feel that characters you care about really might not make it. The book reminded me in the very best way of the sort of fantasy I loved in years gone by. Exciting, well-written, swords and sorcery. Try it on for size. Last night, I finished reading A Time of Dread. I add my standard Caveat. I received this book for free. I do not know John Gwynne. There was a time when I could devour four or five paperbacks a weekend. Books were shorter then, true, but I think it had more to do with my enthusiasm for the genre. As a teen, I was consuming fantasy almost indiscriminately, reading in every slice of the genre. Am I older and more jaded now? Perhaps. Certainly, it seems harder to find book that awaken that elusive ' Last night, I finished reading A Time of Dread. Am I older and more jaded now? Perhaps. Certainly, it seems harder to find book that awaken that elusive 'Sense of Wonder' or the need to turn pages despite what the numbers on the clock say. If you've read any of my other reviews, you know that I detest spoilers. So here is what I can tall you. The story is solid. This is book one Of Blood and Bone. But there were a lot of satisfying arcs here, so I finished the book with the feeling of anticipation for the next one, but not with any frustrations about extreme cliff hangers. The reader knows there is more to the journey, but it feels as if the story stops and makes camp for the night rather than running off a cliff's edge in the dark. Characters. You know how important characters are to me. There are some top notch ones in here. Not all of them are nice. All are believable. I was never tempted to skip a section because it was from the point of view of a character I couldn't engage with. I enjoyed my time with each of them. Sig and Drem, Bleda and Riv . . . (Oh, you know what else I liked? I could pronounce all the names! )None of the characters felt 'constructed for the purpose of this plot.' They stepped into the story because they had always been there. There are scenes of battle and blood and mayhem. They are well written, as are the quieter, thoughtful scenes. There are background politics, and other forces at work in the world. The woodcraft and survival skills of the characters made sense. Those things are important to me. The story places readers within the Land of the Faithful approximately 120 years after the conclusion of the novel Wrath, which was an epic, brutal, and fulfilling climax to one of my favourite ever fantasy series'. The angel-like Ben-Elim rule the land now from their base at the giant-erected fortress of Drassil. They've spent generations uni I received an advanced copy of A Time of Dread in exchange for an honest review. I would like to thank John Gwynne and Pan MacMillan for this opportunity. The story places readers within the Land of the Faithful approximately 120 years after the conclusion of the novel Wrath, which was an epic, brutal, and fulfilling climax to one of my favourite ever fantasy series'. The angel-like Ben-Elim rule the land now from their base at the giant-erected fortress of Drassil. They've spent generations uniting the nations and tracking the remaining forces of the grotesque and scarily powerful Kadoshim, their Eternal enemy. The Kadoshim's leader, Asroth is frozen in metal within the Ben-Elim's stronghold but that doesn't mean his faithful aren't out there plotting, sacrificing innocents and boiling up some horrid actions that could equate to A Time of Dread. In the first book of the Of Blood and Bone trilogy, we only follow four points of view perspectives so we get to know these characters very well. My favourites were the perspectives of Bleda, a warrior Prince who is superb at using a bow and arrow and Sig, a female giant that rides a huge yet loyal bear - she was also a minor character in Gwynne's previous saga. There are a great number of important personae, races, and animals throughout this tale that it might appear overwhelming to begin with but it's worth sticking with. The novel starts slowly as the characters, their allegiances and the history of the world are gently and cleverly massaged into the reader's mind. The world itself is also vast yet the action here predominantly takes place within a handful of fortresses, forests, and the bitter icy North which is known as the desolation. The story features the same areas and cities as the Faithful and the Fallen but time has changed the environment a degree. The history Gwynne has created is epic when describing events some readers will know from 120 years before, as are the revelations regarding important actions and battles that have happened since. This is cleverly done when elders explain the history to younger cast members. I have to admit that I went a bit teary-eyed with joy when occasionally some individuals discussed their relationships with the characters that I had followed for four books previously, and what had happened to them following the conclusion of Wrath. It shows John's unique skill as an author that him just mentioning Corban or Veradis had me so emotionally touched and gripped. I finished the Faithful and the Fallen a year ago so my exact memories weren't crystal clear. The way Gwynne introduces the characters, world, rivalries, and history is sublime, reminding me of the previous stories, however; I honestly believe this would be a great place to start too as the writing is deep, descriptive, and enchanting. This isn't just written for his current fans. You can lose yourself in this world even if this book is your first visit. 90% of the characters are new and likewise, I think previous readers will enjoy it 10% more with prior knowledge and past experiences yet that's not to say new readers won't be engrossed and blown away too. A few old characters are still walking this world. One of them returning made me 'fist-punch' the air. It started off quite slow and steady. I enjoyed the beginning yet analysed this was targeted more at a YA audience. Boy, was I wrong? If anything this is Gwynne's darkest work to date. I should have known really looking at the awesomely designed cover. A Time of Dread contains amazing action scenes, shocking betrayals, intense battles, and a huge death count. The intensity rises right up until the awesome finale at an addictively gripping pace. Comparing back to the Faithful and the Fallen which has a clear alignment of the sides that were good and evil, those areas are greyer this time with political confrontations and even potential revolutions on the horizon between factions. The Ben-Elim were always heralded as the saviours of humankind. Now some people aren't so sure. There are many twists and shocking revelations throughout the narratives final half. I tend to be highly analytical when reading and I only predicted one of them. When that twist was revealed in the last chapter - the fact I had guessed what was to come didn't make it any less amazing. If you've been following my reviews for the past year, you know I'm a huge fan of John Gwynne and the world he created in his original series "The Faithful and the Fallen." I breezed through all 4 of those books earlier this year, thanks in large part to the memorable characters and the epic thread of action that runs through the heart of Gwynne's storytelling. When I found out that he had a new series coming out, I pretty much begged whoever I could find was lucky enough to get a physical ARC f If you've been following my reviews for the past year, you know I'm a huge fan of John Gwynne and the world he created in his original series "The Faithful and the Fallen." I breezed through all 4 of those books earlier this year, thanks in large part to the memorable characters and the epic thread of action that runs through the heart of Gwynne's storytelling. When I found out that he had a new series coming out, I pretty much begged whoever I could find was lucky enough to get a physical ARC from Pan MacMillan which transported me straight back into this world I love so much. Because I know that people will ask: do you have to read the first series (Malice, Valour, Ruin and Wrath,) to understand what's going on in this series? No, you don't. This series takes place 120+ years after the events of the first, so while there is a nostalgia factor involved as characters or places from the first series are name-dropped, Gwynne does a really great job of setting this story apart from his last. New characters are introduced, and a totally new threat carries on that thematic subtext of good versus evil that was always present in the earlier books. Still, as a big fan of the original books, I really did love all the throwbacks included for those fans. The inclusion of Sig, a giantess from the original series, as a POV character in this certainly helps to deliver upon that nostalgia. Because giants have extremely long life-spans, she helps to orient the readers to the ways in which the world has changed over the course of a century. It's a helpful perspective for new and old fans alike. Plus, it's really nice to see Sig develop into such a strong character. The giant clans were some of my favorite aspects of the original series, so it was nice to see that carry over into this book too. Per his usual, Gwynne's characters are fantastic here. They're well developed, and their motivations and actions make sense. There's nothing worse than characters that betray their development for the sake of surprise in a story. These characters and their actions influence the plot as much as the plot influences them, which I love. Also, can I just say that I love how strong women are featured in Gwynne's writing? Sig, Riv and Byrne are all great strong women taking up the mantles from Coralen, Cywen, Edana and Brina from the original series. It's hard to explain why I'm only giving this 4 stars instead of 5 without spoiling. I will say that I was a little disappointed with one particular twist in Riv's storyline. It felt half-told, and though I'm certainly it will be developed much more strongly in the following books, I appreciate when certainly story elements are self-contained within a book. Gwynne drops a lot of clues throughout, to the point that I saw the twist coming, but the reasoning why certain events occur are definitely left for later books to explain. I think that this series has the potential to be even more engaging than the original series was. Fans of John Gwynne should definitely pick this up! While there's a definite nostalgia factor to this book, new readers looking for some dark fantasy are sure to love this as well! A Time of Dread is a breathtaking beginning to what will surely be another utterly brilliant series by John Gwynne. It is no secret that John Gwynne’s debut series, The Faithful & the Fallen, is one of my all time favourite reads. I regularly recommend it to anyone looking for a great read and I have marked him down as a permanent entry on my list of auto-buy authors. 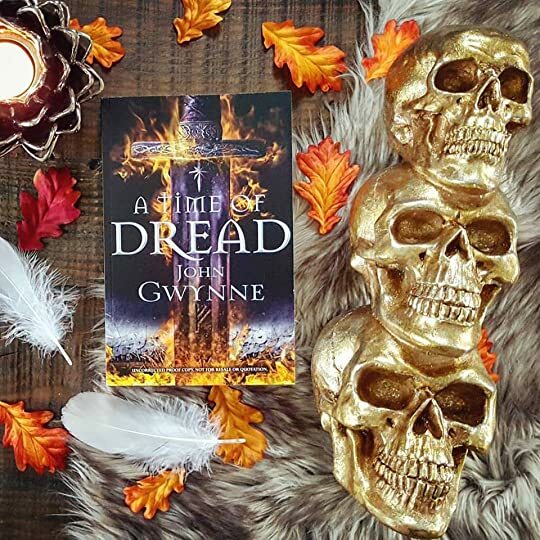 Therefore it should come as no surprise that I was MORE than excited to get an early chance to read his latest book, A Time A Time of Dread is a breathtaking beginning to what will surely be another utterly brilliant series by John Gwynne. It is no secret that John Gwynne’s debut series, The Faithful & the Fallen, is one of my all time favourite reads. I regularly recommend it to anyone looking for a great read and I have marked him down as a permanent entry on my list of auto-buy authors. Therefore it should come as no surprise that I was MORE than excited to get an early chance to read his latest book, A Time of Dread, the first book in the Of Blood and Bone trilogy. Set in the same world as his debut series, A Time of Dread (AToD) takes place about 130 years after the events of the Faithful & the Fallen (tFatF). Avoiding all spoilers for the first series leaves me without the ability to say just about anything about AToD and on the current state that The Banished Lands are in, but suffice it to say that a new peril is emerging and we are given four different POV characters from which to see the events unfold, three of which are new, the other being a minor character in tFatF. When John Gwynne announced this new series, I was both overjoyed at getting to visit this world and it’s characters again, but at the same time very worried. Starting any new series in the same world as an established series always strikes me as a highly precarious prospect. Comparisons are inevitable and having the task of writing characters that can hold up to the love you have for those who came before is not one I envy any author. Fortunate for Mr. Gwynne, he is a rockstar when it comes to characterisation and always writes memorable, fully rounded characters that you can easily love and hate, root for or against. As for the world that these characters are presented in - it is much the same and yet much changed from what we came to know in tFatF. Time changes everything, and it was very interesting to hear different views on how events from tFatF are believed to or said to have unfolded. As many a fantasy lover will know, world-building is the lifeblood of fantasy’s storytelling and in this case it is a resounding success, largely thanks to the groundwork the author has laid in tFatF and subsequently built on in AToD. He has gracefully and effortlessly managed to pen a new and exciting tale, whilst still grounding it in the familiar, rich and evocative history of the Banished Lands, giving fans of the the Faithful & the Fallen much to wax nostalgic about. While most of our heroes have passed on and taken their journey over the Bridge of Swords, there are still a few familiar faces to be seen among the new, and it was a joy reading about both the old and new even as the mentions of some of those absent characters occasionally invoked a strong sense of poignancy. Take a bow for making us care so much Mr Gwynne. This seamless interweaving of two different times is done so masterfully, that I am almost tempted to proclaim that reading the first series is unnecessary if you want to start with this book first. That would be a mistake of two parts though. Firstly, tFatF series is an awe-inspiring achievement in fantasy writing and should be read by EVERYONE. Plainly said, it’s THAT good. Secondly, whilst AToD is still a great read if it is your first John Gwynne book, the added benefit of having read the tFatF series elevates this book from great to absolutely brilliant! There are so many small details and mentions that just give everything occurring that extra little bit of magic, making it so much more fun. The homage Mr Gwynne pays is truly befitting of the ineffable love his fans have for the stories that came before. The pacing is juuuuuust perfect. It might still be early on in his career, but the author seems to have perfected the art of the slow reel, starting leisurely and pulling you in, building up the tension, before yanking you to the edge of your seat. While the early tone set for AToD feels much darker than the one of tFatF, themes of love, friendship, honour, family, and of course truth and courage are still ever present, and still form the foundation of this writing that has grown from strength to strength, book by book. 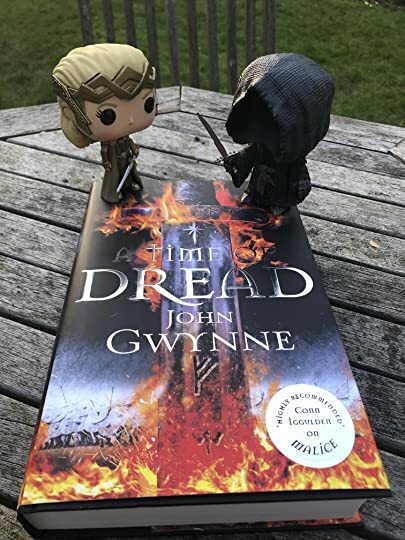 And the action… John Gwynne keeps on reminding us that he is second to none in the this department, whether it is large scale battles or mano a mano, his writing is so immersive and vivid that you cannot help but be transported to the scene of the violent, gory action. I more than once found myself ducking a sword or axe meant for a POV character. And the mentioned dread… it is at first a mere whisper of foreboding, fleeting, hinted at, creeping but ever present. Page after page though, this sense of unease slowly escalates as the story marches on to it’s pulse-pounding climax, relentless, never wavering. By the time the breathtaking closing sequences are done, the dread spoken of in the title is indeed a palpable, living thing that permeates the pages. You can almost feel it’s visceral grip on you as you close the book and fear what the future has in store for our protagonists. A very special thank you to John Gwynne & Pan Macmillan for giving me the opportunity to read this wonderful book in exchange for an honest review. PS: An honourable mention for that breathtakingly gorgeous cover and bonus points for the Old Norse runes on the hilt that spell DREAD! So cool Mr Gwynne, so cool! It's so freaking BADASS I feel like crying over its beauty. 4.5 stars. This is how you write fantasy. The plot opens with a blood feud battle between two clans, several years before the main bulk of our story. It's full of vigour, great descriptions of the action, and sucked me straight in with the mixture of violence and brutality on an epic scale. The main events of the story start several years later, where the majestic angels, the Ben-Elim, rule the majority of the land from their fortre I received a copy of this book in exchange for an honest review. The main events of the story start several years later, where the majestic angels, the Ben-Elim, rule the majority of the land from their fortress of Dressil. Here they train and continue to hunt the remaining Kadoshim - the race of evil that came through the rift so many years ago. The story follows four main characters on their various travails as the increasing danger of the Kadoshim threatens to undue the uneasy balance of peace the Ben-Elim have fought to uphold for so long. Drem is my favourite character of the bunch. We meet him in the first chapters as he hunts with his father Odin in the Wild - the land to the North outside the Ben-Elim's rule. He's naive, with an innate goodness and moral compass. He won't kill if he can help it, even when faced with a fight with a man attempting to hurt his friend. His relationship with his father is also lovely. You can feel the deep amount of love and respect he has for Odin, and his desire to follow in his footsteps. You really feel for Drem, and I was constantly willing him to succeed as his storyline just got better as it progressed and developed. By the end I really thought Drem had grown so much as a character, and I'd taken that journey with him. Riv is a human, raised within the walls of Dressil. She has an undying love for the white wing armies, the people who fight solely for the Ben-Elim, and wants nothing more than to be a warrior and fight the kadoshim. However, is unable to control her anger and rashness in battle. I liked this rashness and lust for battle, although sometimes I did think she was a little 'brainwashed' by the Ben-Elim. Her story was the one that took me most by surprise, and I ended up really enjoying it. She has a strong relationship with her mother and sister, and it was nice to see them take a position of power and respect within the White Wings as unit leaders. It created a strong family unit deeply embedded within this culture of fighting without necessarily needing a strong male role model. I wish more fantasy writers would take this stance. Bleda is the son of one of the clan chiefs seen in the opening battle. Taken as a ward by the Ben-Elim as punishment, he is raised under their watchful eyes in the hopes he will one day return to his clan as leader and a dedicated follower to the Ben-Elim's cause. Bela's storyline I enjoyed the least, and I felt we see the least progression in his character, although I liked that he's so insecure about his nature. There's often an internal struggle between the culture he was raised in, and the need to withhold all his emotions, and the obvious respect he holds for his captures. This leads to a lot of self doubt. It's his growing relationship with Riv however that I found the most interesting, as they're at heart such opposing characters. The hot headed Riv and quiet and thoughtful Bleda. Their blossoming friendship over a bow is great to see unfold, and there is potential for it to grow as events develop further down the line. After the initial opening battle scene, this has rather a slow start - but it takes a long time to build a world so wonderfully crafted. I felt fully immersed, and knew everything I needed to about the lay out of the lands and its vast history and cultures. I hadn't read anything by Gwynne before, and in some respects I felt I may have missed out on some of this rich past and history that readers of previous novels would relish to read about. This never detracted from my immense enjoyment however, but I definitely felt I could have had an even better reading experience if I'd started with Malice. This shows the quality of the writing here, as it takes a clever writer to be able to create such a colourful world and gently guide us through hundreds of years of history without confusing the reader and allowing themselves to get distracted by meandering side stories. Everything that is written here has a purpose, whether that's to develop a character or flesh out the storyline. You can find this review and more at Booksprens. Spoiler-free review. No spoilers from the Faithful and the Fallen series. The quotes in this review are taken from the ARC edition and may change in the published book. Dear John Gwynne, you will never fail to surprise me, and your stories will never fail to make me inevitably cry! Of Blood and Bone is a new trilogy taking place roughly 130 years after the last events of Wrath (The Faithful and the Fallen, #4). And things have significantly changed in You can find this review and more at Booksprens. Of Blood and Bone is a new trilogy taking place roughly 130 years after the last events of Wrath (The Faithful and the Fallen, #4). And things have significantly changed in the Banished Lands. The landscape is definitely different (can’t wait to get my published copy to see the map! ), peace is tenuous at best and ghastly, troubling things are happening all around the land and even at the heart of the Desolation. Sometimes the only answer is blood and steel. Reading A Time of Dread was a tricky experience for me. First, because of huge expectations of course! Second, because I was in a huge slump and I was afraid I would judge it too severely, especially since it’s an ARC. And third, because I kept asking myself if the new characters would rise to the perfection their predecessors achieved. The first one couldn't be helped! The Faithful and the Fallen is without doubt one of the most overwhelming, emotional and satisfying series I've read in my life! But despite its narrower scope, a Time of Dread hinted at unexpected alliances and betrayals, gory action and epic battles coming our way in the sequels! While it still can be seen as a battle between Good and Evil, you will encounter a few shady protagonists and institutions and aside from a few exceptions, you will be seriously questioning some key characters’ motives! As for the second, I avoided falling into the trap halfway through the book by taking a break and going back with newfound eagerness and fresh eyes! And I just enjoyed the last half even more! But then, it wasn’t much of a surprise really, Gwynne has a real talent for concluding his books! And when I started to wonder where he was taking his story, John brought every thread into focus in a most exciting, tense, unexpected and emotional way! Lastly, the difficulty with sequel series is that you need to create new characters and stories that have their own voice and aren’t copies of the old ones, while keeping a coherent link with the latter and sharing a common history and background. John Gwynne pulled off the challenge brilliantly by creating attaching personalities struggling in a much darker and grimmer world than the one we left at the end of Wrath. The story is told from 4 points of view and despite sharing one or two traits with the old characters, they all felt so real and relatable and had so much room for growth! Every action, every thought or every retort seemed to build a new layer in their personalities! "Leaders must act for the greater good." Friendship and family, honor and loyalty are still as central themes as gore, fights and epic battles in John’s books! You will also find familiar elements like the Warrior trials, the Shield Wall, the Sword dance, the giants’ Segul, Wolven… (the mention of these names alone made me tear up inconsolably!) Therefore, the story and plot felt at the same time original and very familiar (coming of age trope, Good vs. Evil, angels and demons, strong family and friendship and human-animal links…) compared to Malice! Which brings me to my most important point: NOSTALGIA! For those of you who’d read and loved tFatF, this book will feel all the more like a precious gift, with a huge sentimental value!! Gwynne celebrated his old cast in such a touching, exquisite way! I felt a pang of pain and nostalgia and love every time one of the old crew members was mentioned (this is no spoiler since more than a century has passed and naturally iconic characters died, but although I expected that, I still felt their loss as if they were friends or family!). For that reason alone I wholeheartedly recommend to start with the tFatF series. The major events of Wrath are briefly reminded throughout the book. However, if you’re new to Gwynne’s work and want to start with this book, you totally can! Gwynne made an excellent job giving enough background and history to make you understand the context and the world of his new story. I feel like great but also dreadful paths are to be expected in the sequels! The tone of A time of Dread was definitely so much darker than the tFatF in my opinion and I wondered if some events and creatures wouldn’t qualify as Grimdark elements. There was also less humor and relief, for this is indeed a time of dread, with nothing except the bittersweet, warm memories and the unbreakable family links to alleviate the darkness! I can’t wait to delve into the next books and see where John’s taking us! And how could I ever forget? A Time of Dread served as a brutal and stunning reminder that Gwynne is one of the greatest modern fantasy writers. The Faithful and The Fallen ("TFaTF") was a superb epic fantasy series with one of the most well-written stories about prophecies and good vs evil that I've read in a very long time. And judging from what I've read in this book, I believe Gwynne is on track to surpass what he did in the earlier series. AToD is the stamp of a great writer that never stops learning and always keeps improving. While Malice was a great debut that any author would and should be proud of, AToD demonstrated that Gwynne has once again upped his game. Over 130 years had passed since the Day of Wrath when the Kadoshim had been defeated. But in The Banished Lands, happily ever after does not exist. The Ben-Elim, purportedly the saviour of all humankind, enforced peace with an almost tyrannical rule that does not tolerate any infringements to The Ways of Elyon or the Lore. However, peace is tenuous at best as the Kadoshim that remain are plotting vengeance. Gwynne seamlessly brought me back to The Banished Lands and made me feel like I've never left, even though it had been over two years since I've finished reading TFaTF. Even without rereading that series, I was able to immerse myself back into the world and relive the incredible bonds of family, friendship and companionship that was the hallmark of Gwynne's stories. Make no mistake, these books are dark; they are brutally honest in the portrayal of good vs evil and the unremitting dangers faced by our beloved characters. However, where we have truth and courage, and love and loyalty, there will always be hope and light. The characterisation is where Gwynne always excelled the most. If you don't care for the characters, then the story becomes quite two dimensional with only the worldbuilding and plot to fall back on. The one constant that I've always felt while I read TFaTF was this impending sense of doom that someone I care about was going to die. It was so emotionally stressful and yet so rewarding when (some of) our favourite characters prevailed. But the thing is, Gwynne does not pull his punches. You will feel devastated, just as you will also feel vindicated and elated. It's nothing short of an emotional roller-coaster - one that you don't want to get off from even though you're worried that you might collapse from a heart attack. In AToD, I grew invested in the characters even faster than I did in TFaTF. For one thing, the smaller cast of characters to follow in this book helped, as we only had 4 POVs. I believed the other key element was the connectivity of some of these characters to those whom we have met and loved in the earlier series. For me, nostalgia played an immense role in creating an almost immediate emotional link which would otherwise take a much longer time to develop. Whenever the words Truth and Courage were spoken, I was transported back in time to those glorious fist-pumping or painful heart-breaking moments. I felt full and empty at the same time when the names of the previous characters were mentioned. So much had been fought and sacrificed for, and yet the fighting was far from over. In fact, Of Blood and Bone is shaping up to be even darker. No review on a book written by Gwynne will be complete without commending his exceptional skill in writing action and battle scenes. While he may have an advantage of having done reenactments in real life, it is by no means a certainty towards well-crafted and realistic action scenes. Gywnne is an undisputed master of close combat sequences that will make you wince and cringe with every slash of a sword, each smash of an axe, and even the wet crunch of a well-landed punch. As an opening book of a new series, the pacing has noticeably improved in AToD as compared to Malice. Even though the beginning was still a bit slower as the new characters were introduced, the plot development was tighter, and events escalated reasonably quickly. The book couldn't have had a more appropriate title. As the narrative unfolded, there was this sense of dread that slowly seeped through and gradually enveloped me as I began to put the pieces together; revelations which were brilliantly handled. The ending sequence was pulse-pounding, blood-gushing and heart-wrenchingly classic Gwynne. It left me in a jumble of emotions; of loss, and hope, and dread. If you have not read anything from John Gwynne yet, this glaring oversight must be remediated quickly. But I do highly recommend to start with The Faithful and The Fallen first (see what I said about nostalgia above). A Time of Dread is that rare sort of epic fantasy that not only appeals to fans of the genre, but also embraces new readers. The world is rich and complex, but you never feel lost or find yourself desperately reaching for a map. The four main characters have the nuance and troublesome qualities we expect from modern fantasy novels, and yet they retain just enough of the classic heroism that got so many of us into the genre in the first place. The plot twists and turns in unpredictable ways, and A Time of Dread is that rare sort of epic fantasy that not only appeals to fans of the genre, but also embraces new readers. The world is rich and complex, but you never feel lost or find yourself desperately reaching for a map. The four main characters have the nuance and troublesome qualities we expect from modern fantasy novels, and yet they retain just enough of the classic heroism that got so many of us into the genre in the first place. The plot twists and turns in unpredictable ways, and yet each time it pulled me along, never once making me want to put the book down. This first book in the Blood and Bone series follows four main characters: Bleda, Riv, Drem, and Sig. Each one is a hero in their own right (none of this sticking you in the point of view of someone you end up hating), but each one struggles both with the strange events going on around them and with their own sense of right and wrong. It's within this subtle and shifting moral landscape where Gwynne really shines, never opting for the easy answers. He'll throw a group of righteous winged saviours your way one minute only to have you questioning their puritanical devotion the next. The moment you think you've found the side to stand with against them, you'll discover that they, too, have their dark secrets. The very uncertainty about each group's motivations that keeps you guessing throughout the novel is precisely what gives Gwynne the latitude to let you trust in his heroes. They might question, they might make mistakes, but they never suddenly turn around and do something vile just for effect. To the contrary, they carry you along with them every step of the way, so that their dilemmas over who to trust become yours. I try not to gush unreservedly about novels, so I won't here. Those looking for that constant gritty edge we've come to associate with Grimdark fantasy won't find it here. This isn't the book where you put it down and go, 'wow, I can't believe someone wrote something that dark'. Sure, there's some evil stuff going down in A Time Of Dread, but it never celebrates that stuff. It is, on some level, a book that treats the reader gently, even as it carries them through scenes both tragic and triumphant. I have very mixed feelings about this book. On the one hand, I loved getting to revisit the Banished Lands, which is among by favorite fantasy worlds. On the other, seeing the way this world has changed in the over a century since the events of The Faithful and the Fallen (TFatF) was painful. But that’s part of the point. While Gwynne’s original series set in the Banished Land had a lot of warring a You can find this review and more at Novel Notions. While Gwynne’s original series set in the Banished Land had a lot of warring and sadness and character deaths, I wouldn’t call it grimdark. There was a hopefulness to the story that in my opinion negated that genre. However, I would say that this first book of the followup series is undoubtedly grimdark. The brightness that managed to shine through in the first series isn’t present here, which made me sad. That said, I get the reasoning behind it. The world that the cast of TFatF fought for has been preserved, but at a high price. It has been undeniably altered, and not for the better. Looking back on the events of the first four books, this alteration saddens me because it makes the fight feel like it wasn’t worth the cost. But that’s not true, and I’m hoping that in the second installment of this followup series, we’ll see a bit more of the hope that defined TFatF. We have a cast of mainly new characters who had no part in the events of the first series. This makes perfect sense, seeing as over a hundred years have passed. But we do have a couple of carry-over characters, which made me incredibly happy! I won’t tell you who they are, because I don’t want to spoil anything, but anyone who loved TFatF will be pleased to see some familiar names. Gwynne did a great job with his four point-of-view characters; they all brought something different to the table and showed four very different views of their world in its current state. Three of these characters, Bleda, Riv, and Drem, are new and young, and have been raised on stories of past. The characters of the original series are legends to these three, which is always an interesting leap for readers. Also, Gwynne continues to write wonderful animal characters, and great relationships between man and beast. That was one of my favorite aspects of the first series, and I was very happy to see that continued in this book. The setting of this book is very dark, at least compared to the preceding series. I don’t want to give anything away by explaining why it’s so dark, so I’m just going to say that you need to prepare yourself for a nearly unrelenting atmosphere of darkness when you pick up this book. There was some disturbing stuff within these pages. I feel like I would have enjoyed it more if I would have been more in the mood for something this bleak. However, Gwynne did end the book on a high note, which alleviated some of that bleakness for me. I really appreciated that writing decision. While I didn’t love it as much as the first series, I’m really excited to see where Gwynne takes the story. His writing has improved (though I thought it was wonderful before), and this series is already less tropey that the one before it. While I enjoyed the first series because of the tropes, I’m incredibly interested to see what Gwynne does outside of them. I read A Time of Dread a little over a month ago, and was waiting for some time to put together a more thorough review... which thanks to both Christmas and a new baby in the house(! ), never eventuated. But with it being released today in the UK, I wanted to add at least some quick thoughts / a recommendation on what I felt was a great read. Much of what I wanted to say, thankfully, has already been said – see Sebastien de Castell’s and Mark Lawrence’s reviews as pretty reflective of my thoughts I read A Time of Dread a little over a month ago, and was waiting for some time to put together a more thorough review... which thanks to both Christmas and a new baby in the house(! ), never eventuated. But with it being released today in the UK, I wanted to add at least some quick thoughts / a recommendation on what I felt was a great read. Much of what I wanted to say, thankfully, has already been said – see Sebastien de Castell’s and Mark Lawrence’s reviews as pretty reflective of my thoughts – but in short, this is classic heroic fantasy that has likeable characters with nuance, and a compelling story which builds at a great pace. No caveats to that, really! Just a thoroughly excellent book that I’d be comfortable recommending to any fantasy reader. Something I did want to single out was that, while this book is set in the same world as The Faithful and the Fallen (John Gwynne’s first series), the fact I hadn’t read those previous books didn’t diminish my enjoyment of this one at all. Characters and events from that series are evidently referenced, but I never felt in the dark or that I was missing out on making connections. So while it would still probably make sense to read The Faithful and the Fallen first (purely to experience everything in chronological order), there’s no reason that A Time of Dread can’t be an entry point into this world. Certainly for me, once I eke out some time for reading again, The Faithful and the Fallen will be high on my list to get to. In summary - this is a great read for newcomers, and I’m gathering just as good (or maybe even better!) for existing fans. Definitely recommended! This book is my fifth by the author, not only did I rate them all 5 stars, they are all in my favourite books shelf, am glad for that. So I'll be optimistic and expect the best from him, I didn't even notice until Petrik mentioned it. This book is a spin-off series of his initial Faithful and the Fallen book series. Just like its predecessors this book wowed me in all the areas. There was no boring moment in this, I was hooked from the beginning to the end, the only problem I have now is that book two won't be published till April 2019. There is a balance of everything in this book, its diverse ( both race and gender), its action packed, has great dialogue, perfect depictions, religion, love, loyalty, friendship etc. If you are not familiar with John Gwynne's books, just know this, he is a master when it comes to world buildings, perfect and straight to the point depictions. The writing is astounding and easy to read. The book is written in third person multiple POVs of the four main characters. Drem ben Olin is a young, kind, honest, honourable man in his early twenties, he is a descendant of one of the survivors from the previous series. He and his father Olin are trackers/ hunter, so yes he can fight, all he knows about the day of Wrath is what he heard in the stories, but that changed when strange things started happening around him. He is also my favourite character. Riv is a teeneger and white wing( humans that fight alongside Ben Elim, to hunt and kill the Kadoshims, they all live in Drassil with some giants) in training. She is pious, quick to anger and reckless, a very bad combination, I didn't like her at first but she grew on me. Bleda, I liked him from his first POV, he is also a teenager who lives in Drassil as a ward of the Ben Elim, He is stoic, loyal and a good person. Unlike Riv he is not reckless, he rarely even lets emotions show on his face. Sig is a female giant and a survivor fron Wrath that lives in Dun Seren, she fights with The Order( Humans and giants that fights, hunts and kill the Kadoshims) founded by you know who. She and the descendants of the war of Wrath work together. Some of my other favourites that don't have POVs include Cullen, Jost and Vald. A century and some decades after the day of Wrath, the Kadoshims are almost hunted to extinction, The Ben Elims and Order still train but the rest of humanity thinks of what happened as almost a myth, thinking the Kadoshims are all dead, little did they know that what they are planning is worse than what happened when the Starstone fell. "They think we are broken. They think we are defeated. Now before I get started, I must confess that this is my first John Gwynne novel. His debut, Malice , was next on my pile to read when I was approved for this beauty so I thought I’d start here. Although I don’t regret it, I do feel like I have missed a lot of cool references to characters of his first series, The Faithful and the Fal First of all, a huge thank you to Pan Macmillan and Netgalley for allowing me to read this in advance. It was brilliant. Exactly the kind of fantasy I live for. Now before I get started, I must confess that this is my first John Gwynne novel. His debut, Malice , was next on my pile to read when I was approved for this beauty so I thought I’d start here. Although I don’t regret it, I do feel like I have missed a lot of cool references to characters of his first series, The Faithful and the Fallen . For that reason, I found the first half of the book fairly slow, as new characters are introduced, the world explained and tales of the original heroes are told. There are a lot of talks and hints about previous characters which I am sure long time readers of Gwynne will love, I just wanted to get started with the new ones. Saying that, the slow start was necessary to making this book (and presumably, series) readable for those who are new to Gwynne and this world, me included. Now I don’t mind a slow pace so this did not put me off reading, but I wasn’t as glued to the story as I thought I might have been after the amazing reviews Gwynne already has for his work. However , I did just read the last 50% in one sitting this morning, so I can say with some certainty that this changes. A Time of Dread is set in the world of the Banished Lands where warrior angels, the Ben-Elim, protect the humans of the realm against the threat of their great enemies, the demon race of the Kadoshim. Yet this is not a tale of Good vs Evil as you may think with that description. The lines between dark and light blur in this story, leaving you not sure who to trust and what to believe. Gwynne is a master story-teller. He weaves the lives of the four point of view characters excellently, revealing just enough of their personalities and knowledge of the world as they go through the novel for you to piece things together and come to your own conclusions. And then blasts them apart in the last 20%. The one thing I need to enjoy epic fantasy is great characters and A Time of Dread has these aplenty. We follow a young man in the Desolation, who understands the difference of right and wrong and wants the world to know it; a young human warrior in the Ben-Elim’s service, trying her best to prove she is worthy of being there; a ward of the Ben-Elim, taken as punishment from his clan to stop them from fighting; and a member of the people who don’t always see eye to eye with the Ben-Elim, but want the Kadoshim dead too. They each have different motives and feelings about the way their realm is governed and their unique insights are one of the main reasons this book is addictive. Even the side characters are well developed and complex. They all felt real, and as their dramas unfolded I really felt caught up in their adventure at every turn. At one point, I felt a certain character’s pain so strongly I had to put my kindle down and take a breath. This is why I love reading, and this novel truly takes you away from reality and pulls you into their world. I love stories told from multiple perspectives as you get to see what’s happening in different areas of the world and see the action unfold around each character. This is also a great way to build up suspense. Gwynne had me cursing several times as huge events occurred in one character’s orbit and left you desperate to get back to them as the next chapter switches you across to the events on the other side of the world. So. Good. It is such an enjoyable experience to be in the hands of a great writer, if at times frustrating. But it’s that desperation to keep reading and then find equally shocking and exciting events happening to this character too that next thing you know you’ve finished the last 50% in a matter of hours and you’ve barely moved. It’s that absorbing. As a matter of fact, his characterizations while not too varied or unusual for the fantasy genre at all, are still rather well done for all that. Time and effort are taken, drawing out familial relations and emotional impact This is my first time reading John Gwynne and I seriously debated whether or not to read the original trilogy before picking up a tale hundreds of years after the events there. It was a close thing, but I decided the strength of his writing would either wow me or it wouldn't. A super solid five stars from me (listened to this on Audible. Excellent narration, too). I'm a fan of John's original series and was happy when I heard this new one was set in the same world, albeit it decades later. That latter works very well. Seeing what came of the struggles we lived and loved previously and how the descendants of those characters we came to know so well (as well as some who're still living!) deal with the aftermath of that terrible war is both intriguing and exciting. Needle A super solid five stars from me (listened to this on Audible. Excellent narration, too). Needless to say, I fell right back in there with John's style of writing and the familiar world is so wonderfully and lovingly created. The characters once more feel real. The world too. The daily life, combat and personalities are rich and real and I thoroughly enjoyed the start to this new series and cannot wait for the next. Full review to come later, after I process this awesome story! I haven’t read the Faithful and the Fallen series, but after reading this book I’m very much a fan of John Gwynne’s writing and I’ll have to go back and read the original series set in this world 120 years before the events in this book. That said I don’t feel like I had to have read that series to enjoy this one since I completely enjoyed it. A Time of Dread is just that. It is the beginning of the ramp up to something dangerous, evil and enough to fill you with Dread. The story starts a little slowly since we are following four different points of view. Since I’m used to reading a lot of fantasy that is a normal thing for me in the first book of a new series. Don’t worry though by the end you should be filled with plenty of dread and so many things will have happened that you will forget the first part was slow. With the four varied PoVs we get to see a lot of this world from different perspectives. Bleda is a prince of a human clan and taken as ward by the Ben-Elim (winged angel people) to ensure that his tribe is peaceful. He has a lot of insight into how the Ben-Elim politics work and how they use fear and their strength to almost hold every human tribe in servitude to them. I liked how his arc showed what everyday life was like in Dressel and how the new threat on the horizon was affecting the Ben-Elim, it showed their long-term goals also in terms of the human tribes and how they are trying to control all of them. Riv is also in Drassil, the Land of the Faithful, with Bleda. But she is from a family of warriors that train to fight alongside the Ben-Elim. Still we find that there is something different about Riv and following her PoV we not only learn about the inner turmoil between some of the Ben-Elim but also what they have been plotting for years. She is hot headed and quick to temper but fiercely loyal to friends and family as well. Drem was actually my favorite PoV. He is the son of a trapper and lives in a sleepy small villiage when they aren’t on the road. But it seems like there are more and more people in the area that just seem a little off and not quite right. I loved his journey and the slow tease of the odd happenings out in the middle of nowhere. His journey from farmboy trapper to hero in the making was a really good one. Plus he was present for all the horrible things we learn about the Fallen and I for one was shocked by those revelations. Sig the final PoV in this tale is a Giantess and while her faction also fights against the Fallen they do not like the Ben-Elim and stay separated from them. It is her tale that seems like would have tied into the prior series more. She is so likeable and ride a bear who seems like the best of both worlds being both a mouth and fighter. Ok, so when’s the next one out?????? Well, it’s safe to say John Gwynne has knocked out another one of my all time favourite books! A Time of Dread is just deliciously dark, full of characters you either instantly love or ones you grow to love, and a plot that continuously builds up to something quite epic! A Time of Dread follows on from the aftermath of The Faithful and the Fallen series, the tensions are high, and the Banished Lands is in much unrest. I cannot say any more than that because I wouldn’t want to spoil the ending of Wrath. As I said, this book has definitely a more darker tone than the previous series; there was a foreboding atmosphere throughout, and the villain’s deeds were so much more evil. This is exactly what I wanted from a series set in the same world, for it to build on the story in a natural way and have the stakes that much higher. Initially it took a while to warm to the new set of characters, having still had the previous characters (Corban and the gang) fresh in my mind. It didn’t take long though and I soon found myself really attached to character’s such as Drem, Sig and Cullen, and then the rest grew on me too! Gwynne is just so good at creating either likeable characters, morally grey ones, or downright evil bastards! It was nice to have quite a few animals again too, which I would have missed if they hadn’t been included. Rab the talking albino crow and Hammer a warrior bear, were both great! One thing I have always said Gwynne excels at is the battle scenes. My god, his battles scenes blow me away each time, I can picture the mess, chaos, fear and filthiness so vividly it’s incredible. Towards the end of this book, the action had my heart racing, had me reading so fast I was missing bits and had to reread, it truly was an amazing last 100 pages. I have to say though that I really felt this book was TOO SHORT. I wanted more; perhaps a few chapters to be longer, a few more scenes at the end, maybe even one more POV. I know a few others I was reading this with, felt the same way. I received a free copy of this book from Pan Macmillan in exchange for an honest review. This book is a spin-off to The Faithful and the Fallen series by Joh Gwynne which is set in the Banished Lands and follows the armies of Elyon and Asroth, forces of good and evil, battle for power. I strongly suggest people read TF&TF before reading The Time of Dread as otherwise you may be confused by story history and character history. I absolutely loved this book which was no surprise to me as TF&T I received a free copy of this book from Pan Macmillan in exchange for an honest review. I absolutely loved this book which was no surprise to me as TF&TF is one of my all time favourite fantasy series, and John Gwynne’s writing works really well for me. Straight away, I was sucked into this story despite things feeling the same but being disconcerting with new characters. I quickly bonded with many of the characters, my favourite being Drem and his dad Olin. I loved Drem’s anxiety tic and how it was portrayed. It’s not often we see strong, male characters portray anxiety like that in high fantasy and i love that it was included. Drem’s relationship with Olin was also just lovely, and I adored the bond they shared and how much they loved each other. I found the Ben Elim and the way they had taken control and rewriten some history really interesting but not surprising because it was obvious they were capable of it in TF&TF. It did make me mad that everything Corban and his company did was so downplayed by the Ben Elim but we know, we know. I also never knew i’d be SO HAPPY to see a talking crow in a book. I love that the crows are in it again, they just give the story a comical air that it needs and some things can get a bit dark and ominous but having a crow just speak their mind makes things a bit more relaxing! I did see the thing with Riv coming for a while but I think it’s a very intriguing turn and I can’t wait to see what comes next. I’m presuming we will follow all of these characters for several years as they get older, like we did with Corban, and I’m so eager to watch their character development and where they go. I also loved seeing characters related to Cywen, Corban, Carolen and Veradis - it made me so happy. And i actually almost cried when the same giants reappeared! It was basically like meeting old friends again, and it’s nice that even though Corban and co are long gone, something remains of the crowd we loved in TF&TF. Also, so here for seeing Storm and Buddai’s descendants. What I loved most about this story was probably the introduction of new characters who are just as likeable and fun as the ones in the first series. I found that it was easy to like the people we meet here, and it was nostalgic when some of the older characters remembered those who were our heroes from the first series too. I think all of the character brought something new and the story was just so much fun! Drem & Olin - These two were some of my all-time faves from the book as they just worked so, so well as a son/father pairing. Drem is the son of Olin and they are trappers who hunt animals and sell the skins for money. They're sensible, clever, reliant on one another, and stoic. They really had a deep bond, and they shared a trust and a love which was immediately evident and particularly touching. I will say that I think Gwynne is superb at showing the family relationships and dynamics in his books, and this is another fabulous example of that. Riv - was a character who is in training to become a white-wing which is one of the Ben-Elim elite guard. Her sister and mother before her were highly praised and they are favoured by all, so Riv feels the pressure and has a lot to live up to, but she's determined and excited and it's her dream. I definitely found Riv's story took a little longer for me to connect with, but by the ending of the book I was hooked and there's some really great moments. Sig - Sig is a returning giant character who we follow and her plot was great. I think that her perspective gave a lot of insight into the political atmosphere and seeing her travelling the world scouring for Kadoshim really brought home the danger. So first of all, apart from a few notable exceptions, I’m not a huge fan of traditional epic fantasy. I much more prefer character-focused stories with epic prose, and for that reason it took me a while to get around to this book. Even at the beginning I struggled to make myself focus, to take in and remember who’s who and what exactly is going on in this world. But I really wanted to like the book, because of all those lovely people involved who I just adore: John Gwynne, of course, and helping him among others his absolutely amazing wife, Caroline, the very cool Edward and Will, whom I got to chat with on a number of occasions now, and even the mighty Kareem Mahfouz! So I marched on, because I really wanted to like this book and … damn! I LOVED it! I did not see that coming! In fact, I’m quite disappointed now that the book finished where it finished and I can’t just go on and find out what happens next! John Gwynne is such a natural and talented storyteller. His world draws you in and makes you feel part of it. As if you listened to the tale while sitting around the fire, sharing dinner with folks from the Banished Lands. It’s flawless. Everything about it fits together perfectly and feels just right. I was also quite impressed by how gradually the book darkened and just how dark it got, the dread descending over me just as much as over the characters, their pain and loss affecting me deeply. Meh. It was okay. Hardly merits a review. If I wasn't 2/3 of the way through The Blade Within series by Joe Abercrombie, I might have been slightly more impressed by this as an epic fantasy than I was. On the strong side, the plot moved swiftly and successfully offered dramatic tension. I was anxious to find out what happened next and barreled forward. On the negative side, the characters were not much more than serviceable, and in fact one main character was incredibly annoying because she had Meh. It was okay. Hardly merits a review. If I wasn't 2/3 of the way through The Blade Within series by Joe Abercrombie, I might have been slightly more impressed by this as an epic fantasy than I was. On the strong side, the plot moved swiftly and successfully offered dramatic tension. I was anxious to find out what happened next and barreled forward. On the negative side, the characters were not much more than serviceable, and in fact one main character was incredibly annoying because she had major anger management issues that drove her to do stupid things. The premise of "angels" who aren't really all that angelic (too fascistic and dogmatic and willing to commit cruel acts for their goals) fighting devils (who do seem to be wholly evil without redeeming qualities) is neither very unique nor interesting. In A Time of Dread, these forces battle each other on Earth in a medieval setting supported by opposing human and non-human allies, such as giants, talking crows, battle bears and hounds. The different races and anthropomorphized animals do add some interest to the story. But the primary theme around the dogmatic hatred for "cross-breeding" of races is a bit too obvious. What's the message here? Racism bad? A few days ago I finished A Time of Dread by John Gwynne, and I loved it so much that it made my ‘best of’ list for 2017. This is an author whose previous series, The Faithful and the Fallen, enjoys glowing reviews and yet for some reason I’ve never got round to reading them. I genuinely don’t know why that is and having now read A Time of Dread my only dilemma is whether I now go back and start with Malice? Anyway, nobody expects the Spanis Wow - full rtf. A few days ago I finished A Time of Dread by John Gwynne, and I loved it so much that it made my ‘best of’ list for 2017. This is an author whose previous series, The Faithful and the Fallen, enjoys glowing reviews and yet for some reason I’ve never got round to reading them. I genuinely don’t know why that is and having now read A Time of Dread my only dilemma is whether I now go back and start with Malice? Anyway, nobody expects the Spanish Inquisition so lets get on with a review and a bit of waxing lyrical about why you need this book in your life. The long and the short of it – this book is epic – it has depth to the characters, it has scope to the story and it has meat on the bones in terms of world building. I admit I hesitate to use the word epic – I don’t know why but it feels overused somehow and even dated in these days of grimdark so I’ll just say that this is a damn fine book. The characters are amazing and the tension that Gwynne creates positively grows into a monster that has you holding your breath anxiously. So, to the story. Told from a number of perspectives this is basically a tale of good vs evil. Of course it’s not quite as simple as that but bear with me. Many years ago the Kadoshim, demons of the Otherworld, broke free from their spirit world to wreak havoc upon mankind. Thankfully their enemy, the Ben-Elim, warrior angels, followed them into the Banished Lands, a fierce battle ensued but an alliance between the angels, giants and men left the Kadoshim out numbered, their Lord was encased in iron and they retreated to the shadows to regroup. So, history out of the way, the story really starts at this point. The Kadoshim are growing in strength and they’re making plans and none of those plans involve humans surviving. Time has a way of making people forget and become complacent. They no longer remember the lessons that the war taught them and indeed some have even begun to doubt that such evil exists. Eventually the Kadoshim begin to feel like a long and distant memory at best or a child’s tale at worst. During this period of peace the Ben-Elim have spread their rule through the lands, encroaching upon other borders. Not everyone is happy living under their rule and this is where the lines between good and bad become blurred. The Ben-Elim may be angels but they are certainly not perfect. They’re arrogant. They have a way of demanding rather than asking which in my mind makes the whole idea of the alliance a bit unbalanced. They (or at least some of them) can be totally unwavering and a bit puritanical. On top of that – they don’t all agree with each other completely. Now, no doubt the Ben-Elim would defend their actions by saying they’re defending everyone and risking their own lives in the process but it also feels that in doing so they’re setting themselves up as the ruling authority in the land, unquestioned and unapproachable. They’ve trained and created their own army of humans (the White-Wings) and indeed have decided that a tithe will be required in future in order to sustain numbers. I guess it begs the question of when does protection become something more akin to rule. The peace that remains is tentative. Factions have started to form and with unknown entities waiting in the shadows, planning their moment to strike its really only a matter of time before hell in a handcart comes looking for trouble. The story is told from four points of view. This is a method of storytelling that I particularly enjoy. I like experiencing the world from different eyes, minds and places and the four characters that Gwynne creates are easy to like making the switch between chapters all that more enjoyable. Riv is a young woman who has always lived within the walls of Drassil, the fort of the Ben-Elim. She trains with almost a religious fervour to become a White-Wing, like her mother and sister before her. Riv shows plenty of potential as a warrior but the temper that she is unable to keep in check is her worst enemy. Her chapters allow us a birds eye view of life in Drassil and a look at how the Ben-Elim and the humans get along. These are intriguing sections in themselves. The people at Drassil are well aware of the Kadoshim and the threat they pose to their way of life and this is obvious in the way they live and train. Of course not everything at Drassil is perfect as soon becomes apparent. Bleda was taken from his home to become a ward of the Ben-Elim following an outbreak of war and to act as surety of good behaviour by his people. He lives within the fort at Drassil and trains with the other potential white wings. Bleda is a good character to read about. He misses his home, even after living away for a few years, he doesn’t fit in at Drassil and at first it feels like he simply bides his time. The Ben-Elim have plans for Bleda that they believe will help keep the peace. Bleda is a strong character, he takes the right course of action even when it appears to be helping people that he doesn’t really like. Sig is one of the giants. I love her character. She’s gutsy and just plain likeable. The giants were part of the original alliance and are also very aware of the Kadoshim. They patrol the borders protecting people from a threat that they’re not really even aware of. The giants live at Dun Seren. Their lives feel completely different to the Ben-Elim and if I was going to choose a place to live in this world it would be with them. They work and train hard, they’re tough, but they enjoy life. The giants ride on bears and have crows that not only talk but display intelligence and loyalty. Sig is probably my favourite character to be honest. She’s just a character that you warm to really quickly and then spend a good deal of time being worried about because she’s always throwing herself into danger. Finally we have Drem. He and his father Olin live outside of the Ben-Elim’s lands. They make an existence as trappers which means they live in the wild for a good portion of the time. They have a fantastic bond and Drem’s chapters make for really entertaining reading. When they return to their homestead changes are clear. Their little town has started to develop, people are leaving the Banished Lands to avoid living under the Ben-Elim’s rule and unfortunately this brings something of an unsavoury element into their lives. The place in which they live as a lawless and almost wild west feel. Drem and his father are governed by their own code of right and wrong and Drem has been brought up with a strict moral code but more than that he’s the sort of character that would always help someone in need. I really enjoyed the chapters where they’re in the wilds surviving on their instincts. There are plenty of other characters but the four main POV perspectives help to keep a grip on them all and stop the read from becoming a people puzzle. I don’t have any criticisms at all. I think that there is one particular thread that is clearly building to a final reveal and, yes, it was easy to guess what was going to happen with that storyline. But, I imagine that was the author’s intention to be honest. And, not a criticism, but this book doesn’t step into the realms of grim dark as we’ve come to know it. Of course there are battles and inevitably bloodshed but A Time of Dread manages to have an old school feel at the same time as breathing new life into the realms of swords and sorcery. If it isn’t clear already, I thoroughly enjoyed this book and can’t wait for No.2. No pressure at all Mr Gwynne. Having never read any of John Gwynne’s previous novels, but being aware of them and them being held in high regard, I was quick to request this as soon as I saw it. I was in for a treat! This, soon to be, trilogy takes place in the same world as his previous books but some 100+ in the future. I don’t think having not read those books took anything away from reading this, I still found it really good, but I do think that having all that knowledge from the previous books would have enhanced my enjoyment further. The story is split with multiple POV’s with complete differing styles that don’t appear to be linked in anyway but as things progress all the strands come nicely together. As with these types of books there are often POV’s that stand out to those that don’t but there weren’t any I was dreading which was a bonus. Things start out at a slower pace but by the last 20% or so things are moving rapidly and it was hard to put it down. Not only am I keen to read the next two in this trilogy, I’m also keen to pick up all the authors previous work. Highly recommended. Malice is my debut novel. Goldsboro Books of London, specialists in signed first-editions, have made Malice their 'Book of the Month' for December 2012. I was born in Singapore while my dad was stationed there in the RAF. Up until he retired that meant a lot of traveling around, generally a move every three years or so. I live with my wife and four wonderful (and demanding) children in East Sussex. Malice is my debut novel. Goldsboro Books of London, specialists in signed first-editions, have made Malice their 'Book of the Month' for December 2012. I live with my wife and four wonderful (and demanding) children in East Sussex. Also three dogs, two of which will chew anything that stands still. I have had many strange and wonderful jobs, including packing soap in a soap factory, waitering in a french restaurant in Canada, playing double bass in a rock n roll band, and lecturing at Brighton University. And somehow during this time I started writing. I’ve always told my children stories at bed-time, and they pestered long and hard for me to write some of it down. At the same time I felt that my brain was switching off a little - vintage furniture is my wife’s passion, whereas my passions are geekier! That’s how The Banished Lands and Malice began, though along the way it became more than just a hobby. I’m still in shock that it is actually a real book, rather than just pages on my desk.